Right when you noticed that it had been awhile since you heard from her (I noticed you noticing), Hillary Clinton popped in at the Democratic Women's Leadership Forum yesterday, to hype up the women's vote as well as all of the female Democratic candidates in the upcoming midterm elections. "For too many women, for too many families, they don't just face ceilings on their dreams," said the former Secretary of State. "It feels to them as though the floor has collapsed beneath their feet. That's not how it's supposed to be in America." She said a national movement is building around issues facing families, such as wages and paid family leave. "This movement won't wait and neither can we. And that's why we're here today. And we're also here because the midterms really matter." 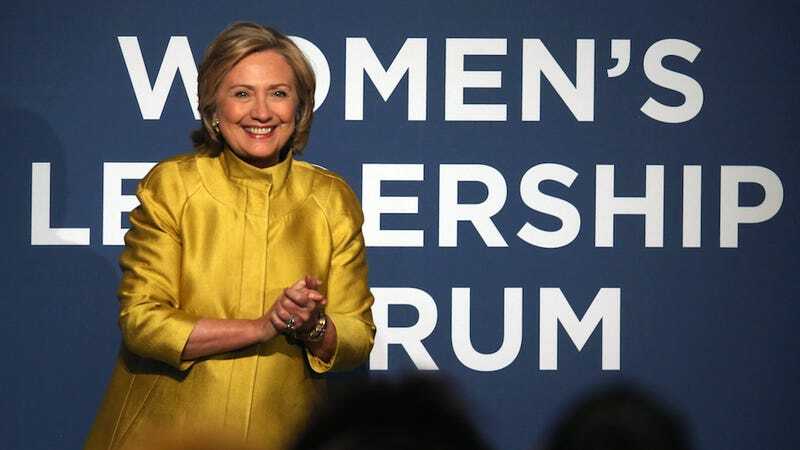 I can't think of a better way to make the House work again than electing every woman on the ballot," Clinton told the Democratic Women's Leadership Forum, a group she helped start more than 20 years ago with former Second Lady Tipper Gore. "There are 10 women running for the Senate, six women running for governor and I wish I could vote for all of them." Obviously the women's vote (while always important) has proven to be quite the fierce battle ground for these midterm elections this year. So that paired with Clinton's impending presidential campaign decision makes this a pretty advantageous appearance for her.